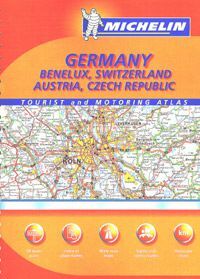 Road Atlas of Germany, Benelux, Switzerland, Austria and the Czech Republic. Great driving atlas for the whole area in an easy to use format. The map scales vary with Germany being the most detailed at 1:300,000. The Belgium, Netherlands, Luxembourg, Switzerland and Austria maps are at a scale of 1:400,000 and the Czech Republic maps are at a scale of 1:600,000. 301 pages including an index and a section of city maps.